Prior to the start of our tour, Rick and I had one free day in Amsterdam. Thank goodness he knows the right people. 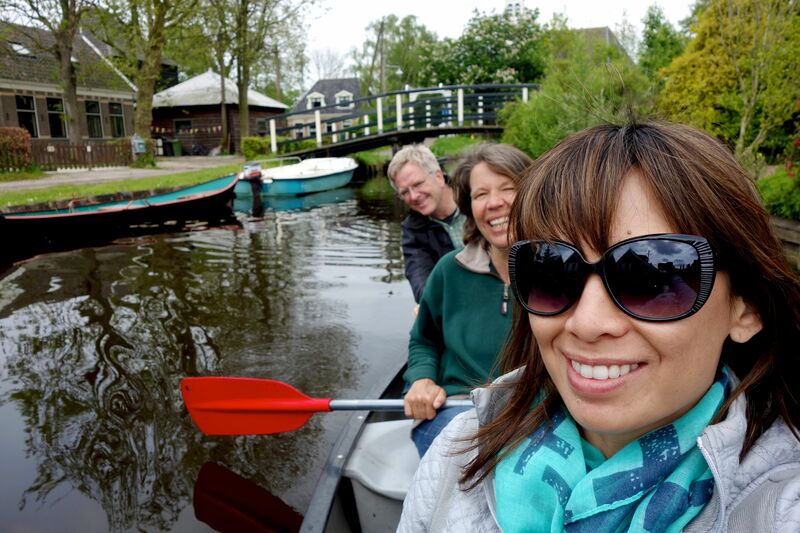 Majel, who runs Wetland Safaris, took us by canoe through the polderlands (former marshes, now peat land puzzle pieces with canal arterials) just north of the city. It was delightful get some outdoor exercise, to see this area from water level and jump around on the bouncy earth that essentially floats on the water. Jodi explains the dishes we’ll be enjoying for our rijsttafel. We met up with our group that evening in Haarlem, a small town just half an hour from Amsterdam. You can imagine the looks of shock and awe when the tour members realized Rick would be joining them for the next 21 days (we had signed up under pseudonyms). Once heart rates returned to normal, we headed off to an elaborate Indonesian-Dutch rijsttafel, or rice table, dinner (Indonesia is a former Dutch colony). Four-meter long tables are lined with a myriad of Indonesian dishes, which everyone savors family-style. A prepared traveler is a smart traveler. 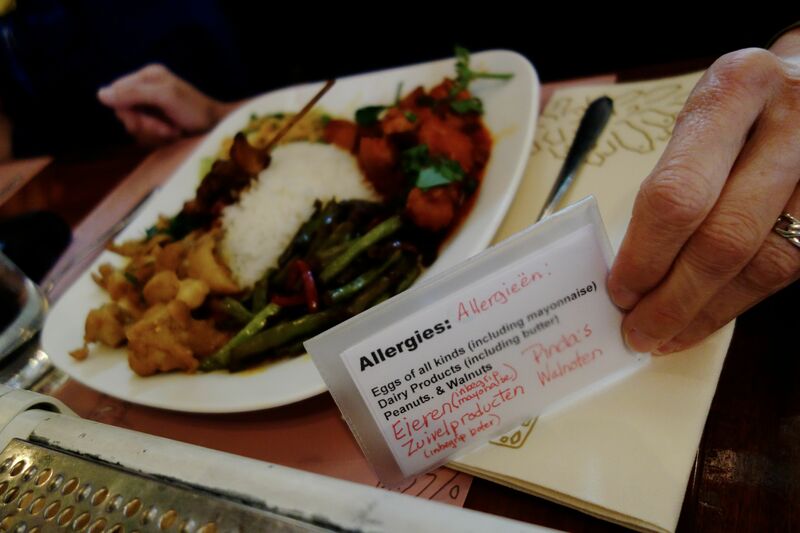 Our new friend Roberta has some dietary restrictions, but like any good travel, she is well prepared. For every country we’re visiting, she’s prepared various “I can’t eat this” cards, written in the local languages for the countries we’ll visit. She doesn’t have to worry about miscommunication and the restaurant staff is stress-free and happy to accommodate her. Plan ahead: book a reservation time for museum entries or wait in lines like these. The next day was a full one in Amsterdam, and in a city as popular as this, traveling in a group like ours has its advantages. 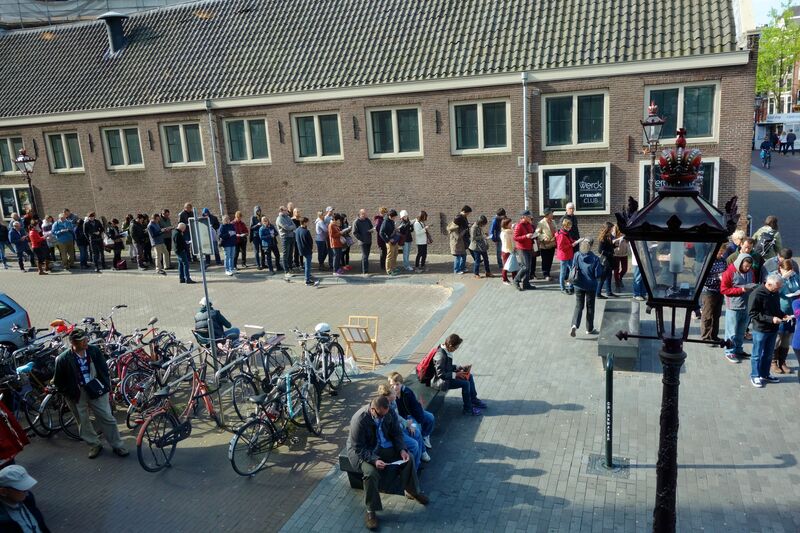 While most people who weren’t savvy enough to make an appointment for their Anne Frank Museum entry would wait for over an hour in the line, our group had a reservation and were the first (and only) people in the museum at 8:45. It’s a real luxury to be able to linger and move within a tiny space without sixty other people pushing you. It allows you to take your time to learn more and process better the historical and emotional impact of what the young Anne Frank and her family went through in World War II Amsterdam. Rick and I were the first people that day to step through the bookcase and into the hidden world of Anne and her family. 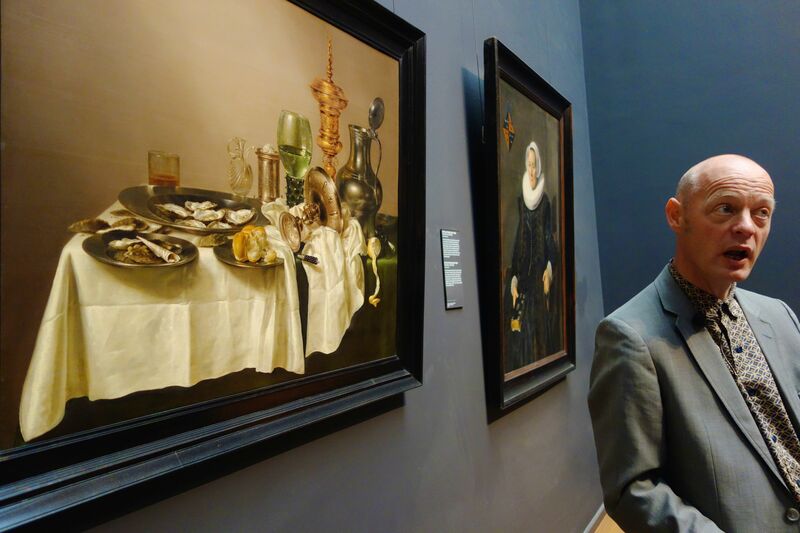 Robert teaches us that even a still-life can reveal so much about the Golden Age of Dutch art and society. After a walking tour of the city, we joined a quality local guide at the newly re-opened Rijksmuseum. He was expert at connecting the style, technique, and subject matter with the religious, political, and financial atmosphere of the Dutch Golden Age. The Netherlands–moving towards Protestantism–was separating from its Catholic Spanish Hapsburg overlords. Merchants were the civic leaders and had enough money to commission private works, rather than the Church paying for art to adorn their houses of worship. 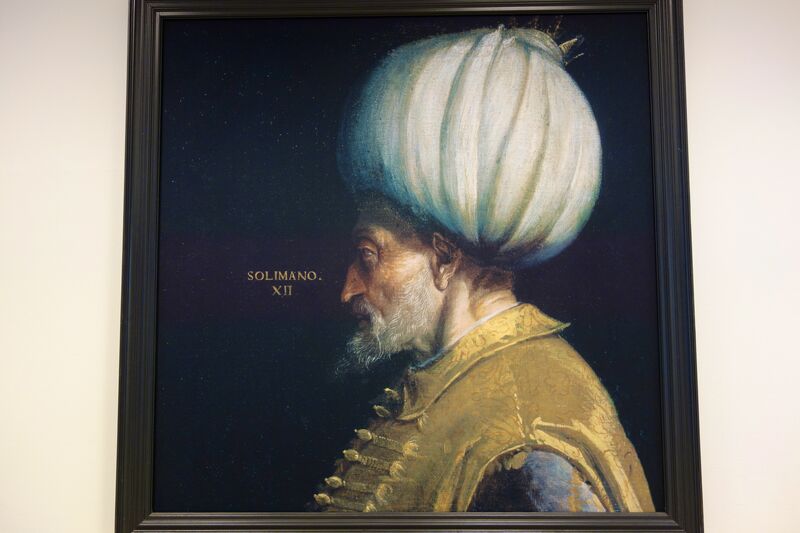 It’s hard for even Rick to resist taking a picture of one of the Western World’s greatest masterpieces. 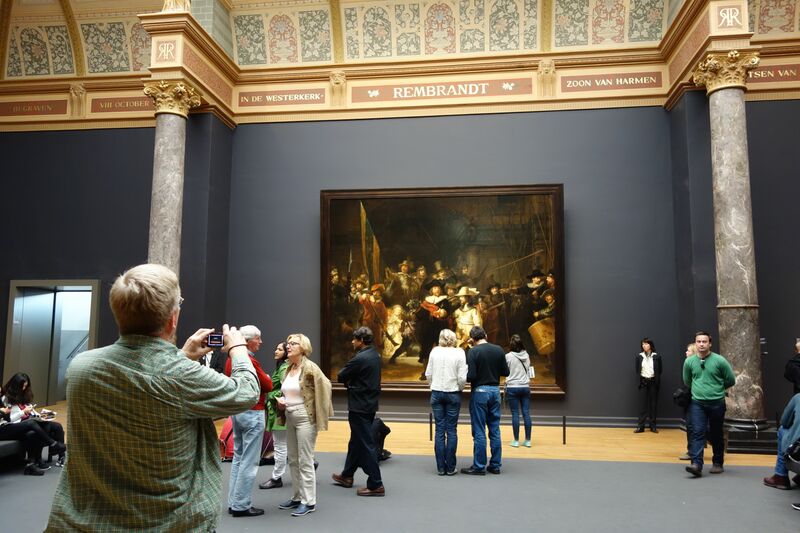 In the museum, Dutch masterpieces biggies by Rembrandt and Vermeer are proudly displayed like altarpieces in a church of art. Art enthusiasts and neophytes alike stand humbly before them in wide-eyed admiration and snap selfies and wide shots to prove they’ve been face-to-face with the greats. Even Rick gets in on the fun. A canal boat ride gently rocked me into nap-land for a little while, and the walk through the Red Light District proved entirely uneventful: no one in the windows. But even if there had been, a walk through this area of town reminds visitors that Amsterdam–which has always been a port town (Hello, sailor! ), a city of major commerce from all over the world for centuries (interaction, cooperation, and integration, with many ethnic groups), and, since the split with the Hapsburgs, a religiously and morally tolerant community–is a city that understands that people are human and capable of making their own adult decisions. What we would deem as crimes in the United States (i.e., prostitution and drug use) are considered social and health issues in the Netherlands, dealt with in creative ways that work for their social ethics. That means that both prostitution and marijuana use are tolerated, regulated, and taxed. Prostitutes don’t run to a pimp for help; they have an emergency button to alert the police if they are in danger. They also get licences only after regular health check-ups to prevent the spread of disease. Per capita drug use in the Netherlands is lower than in the U.S., and drug addiction is addressed as health issue rather than throwing everyone in jail. It’s so easy to get excited over tulips at Keukenhof. 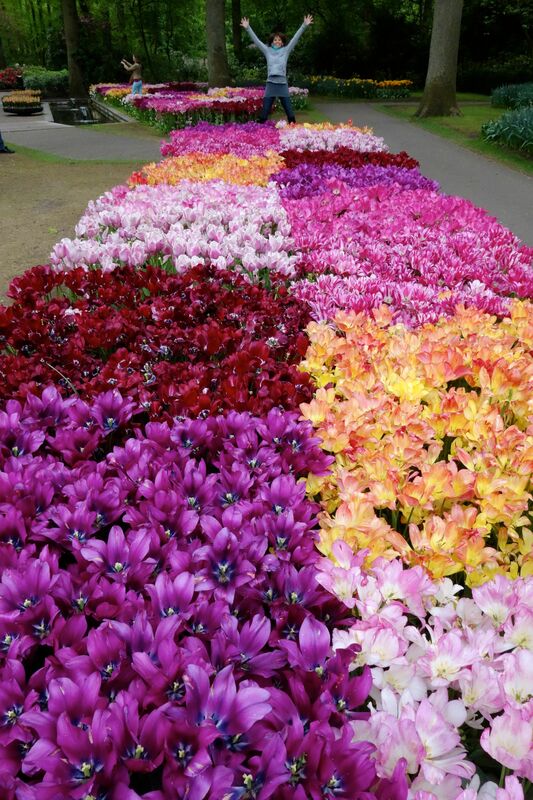 The next morning, we succumbed to Tulip Mania at Keukenhof, a 79-acre flower garden–the world’s second largest. Covered with virtually every variety of tulip, bursting with the colors of 7 million blooming bulbs, it was easy to understand why these non-native plants, whose name is derived from the word Turkish word tülbent or “turban” (they were originally brought to the Netherlands from the mountainous regions near Turkey, Afghanistan, and China), were considered luxuries and status symbols for 16th- and 17th-century elites. People were so crazy about flowers, which were traded like futures, the inevitable economic tulip “bulb-ble” burst in 1637. Investors were ruined and Dutch commerce nose-dived. 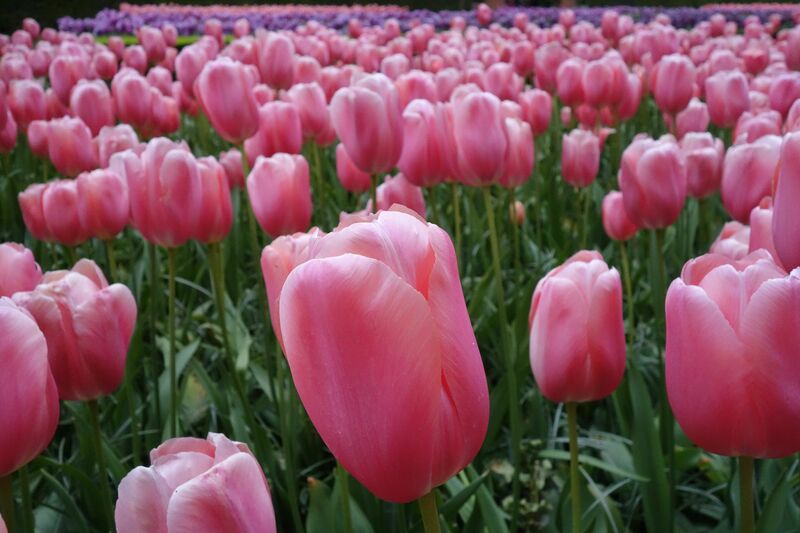 Lucky for us, today’s Dutch tulip growers and exporters work collaboratively to bolster their floriculture industry and showcase their commodities, so visitors–like those on our Rick Steves’ Best of Europe tour–can “ooh” and “ahh” and have their own temporary Tulip Mania. 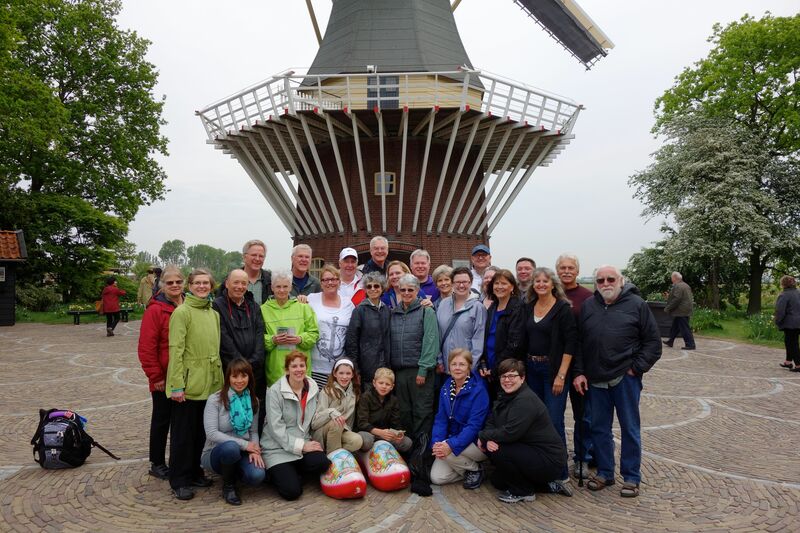 Our group is in for lots of great adventures and tons of fun as we explore the Best of Europe. Hi Trish. 🙂 I love your photos and descriptive writing. Have you worked as a professional writer? Do you have anything published? Hi, Kathy. I just sent you an email. Take care.